Joe Murphy/Getty Images Twitter can empower strangers to ruin your whole day. 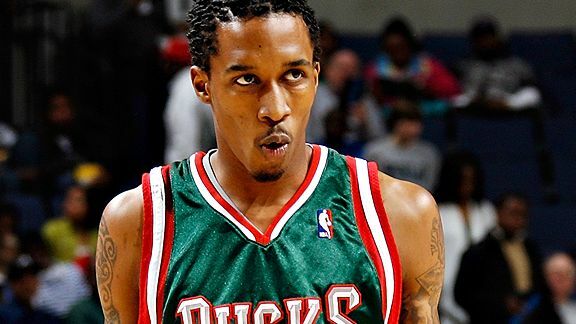 Brandon Jennings learned that the hard way. It started -- as all good feuds do these days -- via Twitter. After posting that Jordan Farmar was a "groupie," Milwaukee Bucks guard Brandon Jennings (aka "YUNGBUCK3") found himself caught up in a war of 140-character posts with the Laker guard. After all, "JFarmar1" responded to Jennings' posts. From there, the two traded "I'm not saying, I'm just saying" jabs. The dispute peaked when Jennings wrote, "[B]ut I'm not going to beef with you. See you should be worried about your spot. Shannon Brown??? That's all imma say." Only problem was, Jennings was dealing with a faux-Farmar. But how was Jennings supposed to know? I mean, wouldn't it be great to know whether someone really was who he/she claimed to be in the Twitterverse? Of course, Jennings did sport a "Verified Account" badge at the top of his Twitter page for just that very reason. JFarmer1...not so much. The gaffe marked Jennings' second social networking faux pas in the last month. The rookie was also fined $7,500 by the league for celebratory postgame tweeting. Jennings seems to have gotten the message this time around. He deleted his account Tuesday night, paving the way for plenty of YUNGBUCK3 impostors to pop right up.